This chapel was completed over 30 years ago. Craig Kinney recently visited and was taken with the stained glass windows. KFW just completed a restroom addition to a much larger, earlier project, the Texas Bank Sports Complex. Everything was painted grey and the jail spaces blended into a pervasive flat grey color--the walls, the cell bars, the concrete floors, the dirty ceilings, all was grey. Even the fluorescent light beamed a harsh grey-blue. Everything that could possibly be vandalized was vandalized--the TV's, the lower ceiling fluorescent lights, and the exposed plumbing. Graffiti was scrawled into every surface. Metal mirrors were so scratched that my image resembled a fractured Willem de Kooning painting. Since there was no natural light, it was hard to determine the time of day. I was told that prisoners stayed up all night when the lights were off and slept all day when the lights were on. So, during the day, to block the light, inmates tucked scraps of cloth and newspaper over the lower light fixtures so they could sleep. Inmates dragged their thin mattresses onto the floor and pulled their blanket or sheet over their head to sleep. They looked like mummies...or corpses with a sheet over them, the kind you see on TV cop shows. Ceilings were typically so low you could reach up and touch them without tip-toeing due to the jail being a renovation of an existing building. It felt like a coffin lid. The jail was like an underground rabbit warren of tunnels with corridors snaking this way and that. 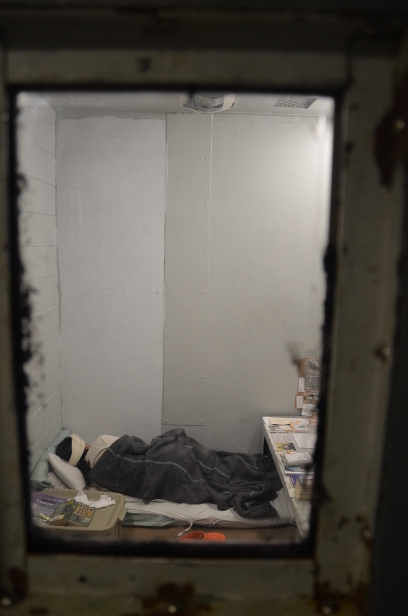 It was difficult to understand the layout and to understand where you were in the jail. Many corridors couldn't be monitored due to the layout. Many corridors were dead-ends and were only about three feet wide with cell bars stretching to the end of the corridor. Views were truncated due to the many bars. Looking down the corridors, you could see hands gripping the bars but no attached body due to the blocked view. I saw the misspelled word "desperite" scratched into the wall of a cell. There were similarities to a zoo: caged animals being observed as they lived their lives behind bars. The staff reported difficulty in keeping employees working over three months before they quit. No wonder. Design a jail? Who would do such a thing? Architects are taught to design "pretty" buildings and jails are definitely not pretty. Right? Turns out, some very good architecture firms design jails. My preconception was that, by necessity and by a general code of what Western justice means, jails needed to be as austere and minimal as possible: criminals need to suffer for their misdeeds and reflect on what freedom meant. Wasn't the sheriff in Arizona--Arpaio?--setting a great example? Weren't the criminals there repenting of their sins and swearing off a life of crime? Turns out, they are not. Turns out, the opposite appears to be true. I came back from the jail tour confused and shaken. Jail design didn't interest me--at least it didn't before the tour. Honestly, I was more interested in the design of projects that had a decent chance of being what I deemed aesthetically pleasing. But, as I lay in bed, I began to ask myself questions. Why practice Architecture? If architecture is going to make a difference, shouldn't it be involved in making things better? What happened to my understanding of architecture as a real force for good? Had I become more of a style-maker instead of a difference-maker? After this tour, I went on another tour of a different jail in Lubbock County. This jail had a vastly different model of incarceration, one that is "kinder and gentler," where the treatment of inmates gets many people in these parts riled up because it's not the "lock 'em up and throw away the key" style of justice. The difference could not be more striking. The Lubbock jail has an abundance of natural light, ceilings are high, TV's are within reach and available, a self-serve drink bar and laundry are within the multi-inmate spaces, counseling is available, the noise level is much lower, and instead of bars there was glass. There was very little vandalism. If I were to pursue a life of crime, I would do the crime in Lubbock in lieu of Tom Green County, just in case. There seemed to be less tension and despair in the air. Perhaps the greatest difference between the two jails was that the Lubbock jail followed a "Direct Supervision" model where guards are in the same space as the inmates; at the Tom Green County jail, there was "Indirect Supervision" where guards are in a separate and secured space observing the inmates. I live in a fairly conservative West Texas county where many of the populace sip the tea from the Tea Party. And so, when the officials most involved with the jail--the Sheriff, the Jailer, and our County Judge--expressed that they had been completely wrong in their thinking on justice issues, I was impressed with their humility and I began to really focus in on what they had to say. During several lengthy discussions with these folks, as we toured the different jails, I learned that the recidivism rates between these two jail models were radically different and this difference translated to money. The direct supervision model (Lubbock County) cost slightly more money to build and yet, because the recidivism rate is lower and because it's easier to keep trained staff on hand (and fewer staff), in the long run it is more cost effective than the indirect supervision model (Tom Green County). Being more humane is more fiscally conservative. Imagine that. "Humans are animals and animals adapt to their environment," said one of the jail staff. I think what was meant is that if we place anyone in a brutal atmosphere, they adapt...and become brutal; and that if we build something that is more ennobling, people adapt to that environment as well. Perhaps another way to say this is by Winston Churchill: "We make our buildings and then they make us." Our built environment has a say in who we are becoming. My hope is that the architecture we do in our small city does more than merely improving aesthetics and that our buildings can be instrumental in promoting a better way to live--even life in a jail.